What happens when Brabus, the German tuner gets ahold of the Mercedes-Benz G 63 AMG? They produce the Brabus B63S 700 Widestar with 700hp. The launch of the Brabus B63S 700 Widestar took place at the Dubai International Motor Show, held from 5 to 9 November 2013 in the Dubai World Trade Center. And the Dubai Police will get the high-performance police cruiser to catch the bad guys. This high-performance power off-roader with 515 kW / 700 hp symbolizes the fact that safe automobile tuning and driving pleasure are closely linked and need to be mutually exclusive. 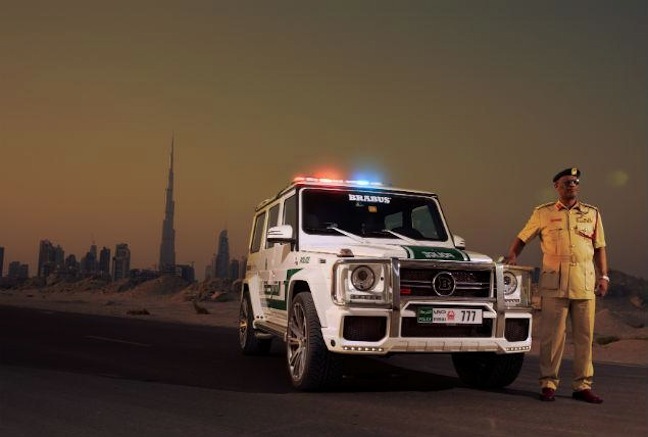 This initiative is welcomed by law enforcement, which is why the Dubai Police will also use the BRABUS upgraded G-Class from Mercedes-Benz to do duty on the streets of the city. The press release fro Brabus says the B63S 700 Widestar will be used as the central element of the TUNE IT! SAFE! initiative. The Dubai Police will provide an important educational service with the police vehicle. There must be an issue onthe streets of Dubai with fast vehicles, because of all the oil related wealth. The legally and safely tuned vehicle will enable the Dubai police to provide some important public information on the streets of the city. As in Germany, where TUNE IT! SAFE! has established itself as an information platform for all things relating to tuning, sporty automobile accessories and general traffic safety, the initiative aims to raise awareness in Dubai, so that safety is not forgotten when it comes to automobile tuning. This isn’t the first Mercedes G63 the German tuners has turned into the ultimate performance G63 AMG. The did it with the 6X6 version and turned it into a real beast. Just how did Brabus upgrade the Mercedes-Benz G 63 AMG? It gets a 700 hp 5.5-liter V8 biturbo engine that enables the all-wheel drive police vehicle to reach a top speed of 240 km/h, sprinting to 100 km in just 4.9 seconds. It sounds like the police will be using this ultra-performance SUV for more than education. The Brabus B63S 700 Widestar in Police livery will soon be seen on the streets of Dubai where the upgraded 700 hp Mercedes-Benz G 63 AMG will be used for “educational” purposes.